Google’s core algorithm will now look at the quality of the content on your site. There will no longer be periodic Panda updates as it will now run with Google’s core algorithm. Now, more than ever, relevant, unique, high-quality content (and no duplicate content) is of the utmost importance to Google. If a site has poor quality or duplicate content, it can be hit by a Google penalty which will cause a severe decline in organic traffic. 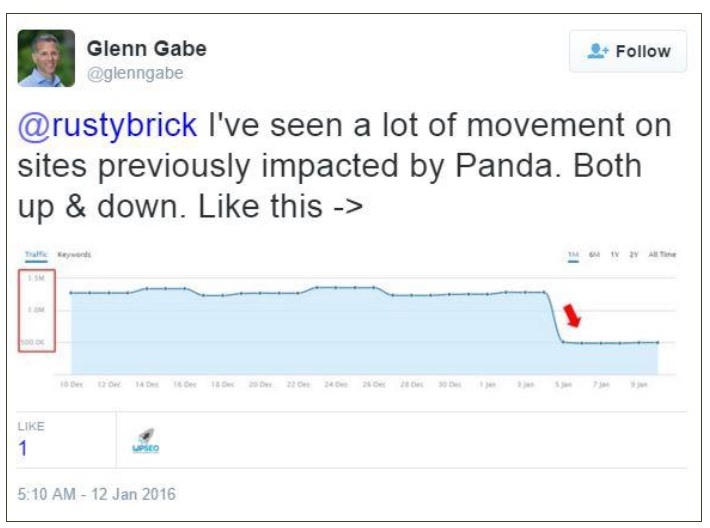 Some websites have already seen a massive impact from this Panda update. For example, this site saw a steep drop in traffic. What might this mean for affiliate sites? Affiliate sites with poor quality or duplicate content may be hit with a Google penalty and will see a decline in organic traffic which could result in a decline in traffic and revenue to merchant sites. The next update to Penguin, which penalizes sites with spammy links, is coming soon but we’re not entirely sure when. We just know that it is scheduled to be released by the end of Q1. Vary your anchor text keywords to make sure most are branded or URL. Monitor backlinks and look for sudden spikes or anything out of the ordinary. For super spammy links you cannot remove, disavow the links in Google Search Console. Optimize your internal links so that they flow in a natural way. For example, add related products to product pages, maintain as much of a hierarchy as possible, use canonicals, etc. Continue to utilize tools like Moz’s Open Site Explorer to identify any spammy, irrelevant links. Links to and from a website can both positively and negatively impact a site’s organic traffic. Affiliates with low quality links may see a decline in organic traffic as a result which could affect traffic and sales to merchant sites. If you need help identifying whether your site has been hit with a Google penalty, need assistance getting out of the penalty box, and/or want to develop a strategy for how to prevent a penalty, contact our SEO team today and we’ll be happy to help! Excellent content for google algorithm panda. I fully agree with you BONNIE. Good job.